When the Troop organised a hike to Swinsty and Fewston Reservoirs I tucked Sheet 96 in my rucksack, but David and Peter Wardman knew the way without referring to it. I walked easily up at the front, and by the finish I knew I could have done more: hiking was to be my forte. Michael struggled but made it through. He carried a slight limp from a dose of polio, and he was a heavy lad, cruelly nicknamed ‘Barrel’ at school by Vernon Barritt, who seemingly knew no better than previous generations of teachers, if Dad’s tales of his tormentor, Ben Hartley, were anything to go by. Robert was an irrepressible little so-and-so who remained below average height until a late teenage growth spurt, and throughout the walk he devoted much of his energy to calling out cheeky jibes at the Wardmans from his position at the rear. At the end of our fifteen miles, we lads all declared we’d enjoyed it and would go again, and we got our chance a few weeks later with our first Midnight Hike. Darkness magnifies our fear of the unseen. It deprives us of what we think is our most used sense. We imagine all manner of peril around us. As the days slipped by, uncertainty plagued us: how would we handle the sleep deprivation, the cold and the fatigue? When we talked about the looming hike, looks of concern passed between us. Would any of us opt out? Unless you were a Catholic boy who had to serve at Mass, in which case you’d not be allowed out over Saturday night. Ours was the only non-denominational Troop in the town: all the others insisted on attendance at church parade once a month; the Catholics didn’t have a Troop at their church, so they had to come to us. 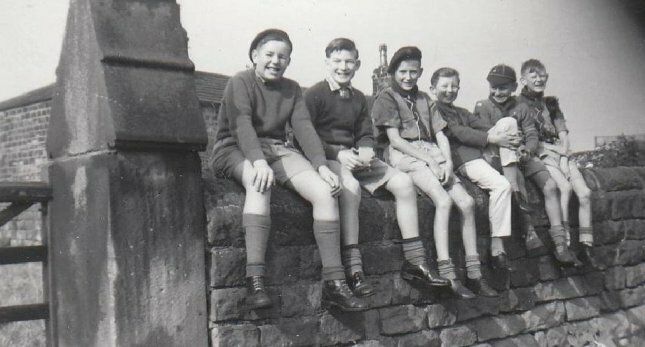 Michael, Robert and I met at the Scout Hut, a few yards up Leeds Road from our house. The time was 2230h, well past our usual bedtime. At the outset, we received our instructions: keep the noise down, and don’t use your torch. Tell that to a bunch of excitable youngsters on their first night outing, armed with torches they want to use and show off, possessed of the impish desire to scare their mates with ghoulish grimaces lit from below the chin! We took some calming down. I can’t recall who else was with us or where we went, but I certainly remember the thrill of doing something new and daring. We made it through the night, and I slept until lunchtime, after which I had a very steady afternoon and went early to bed. Monday brought the pleasure of telling the tale to school friends and observing their responses, which ranged through disbelief, admiration, incomprehension and cool indifference. The Scouts ran a couple more midnight hikes, one of them under a full moon over frozen snow. We stayed warm by keeping moving and snacking only briefly. As we passed the ancient Swinsty Hall, Robert frightened Michael with claims of ghostly sightings in the trees. Ridiculous though the claims were, insistent repetition made them seem increasingly believable to the impressionable Michael. The poor lad cast anxious eyes this way and that, silently appealing for someone to reassure him, but we cruel boys denied him such comfort, preferring to back the likely winner. In some ways Dr Light was right, because as I was growing older more opportunities to be adventurous – daft, if you like - were coming my way, and at that time most of them came through the Scouts.